In a particularly infamous 1986 commercial for Vicks Formula 44, one that spawned a deathless catchphrase, actor Peter Bergman boldly declared, “I’m not a doctor, but I play one on TV.” Ken Jeong, star of ABC’s Dr. Ken and real-life licensed physician, might be one of the few people in Hollywood who could legitimately say, “I am a doctor, and I also play one on TV.” Under those circumstances, there are few people more qualified to evaluate a passel of pop culture doctors than Jeong. So that’s just what Vanity Fair has him do in a newly released video. 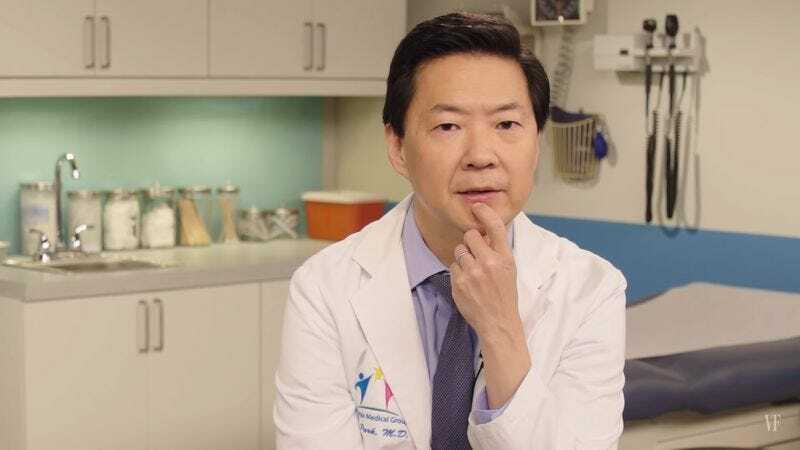 From the set of his eponymous ABC sitcom, Jeong gives his professional and aesthetic views on M*A*S*H, House, ER, Dr. Oz, Star Trek, Young Frankenstein, and much more.